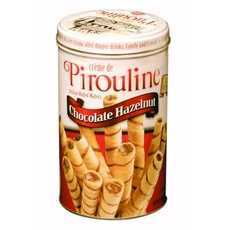 Enjoy De Beukelaer Chocolate Hazelnut Pirouline Rolled Wafers . The Perfect Wafer Snack For Any Occasion. Sweet Chocolate Hazelnut Wafers Are Great For Gifts, Parties, Coffee, Ice Cream And Desserts. Food Type: Cookies; Flavor: Hazelnut; Capacity (Weight): 14 Oz. (Note: Description is informational only. Please refer to ingredients label on product prior to use and address any health questions to your Health Professional prior to use.